An anterior cervical discectomy (ACD) is an operation that is performed for a herniated cervical intervertebral disc (slipped disc) which is causing pressure on the related nerves or the spinal cord. The aim of the operation, which is performed from the front of the neck, is to remove this pressure by taking away the disc, the disc prolapse and any bony outgrowths/osteophytes that may be present. In some cases several discs need to be removed. At times even one or two vertebral bodies need to be removed to free the nerves and spinal cord. 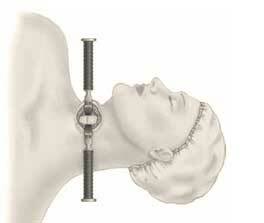 This latter operation is called a corpectomy (corpus is the Latin for body of the vertebra). 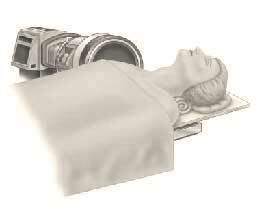 These operations usually require that the discs and vertebrae that are removed be replaced eventually by bone. Bridging a gap like this with bone is called an anterior cervical disc removal and fusion (ACDF). To enhance the likelihood and the speed of fusion and for the maintenance of the normal height of the disc space and the normal alignment of the neck vertebrae, the space is filled mostly with the patient's own bone or bone from a bone bank. A spacer made of metal or plastic is often used as a receptacle for the bone. In the top picture a patient is positioned in the standard way for an anterior cervical discectomy. The machine in the picture is called a fluoroscopy machine and takes X-rays of the neck so that the specialist can constantly monitor the operation. There is a soft ring for the head to rest on. A bolster or small cushion is placed under the neck and shoulder blades to stabilise and also to extend the neck in order to slightly open up the discs in the front. This facilitates removal of the disc. This drawing shows the anatomical location of the bony spine in the neck. This drawing shows that the specialist has made the incision and has dissected down to the spine. The space is held open with hand held retractors. Note how you can see the vertebrae and the discs. The patient's own bone is regarded as the gold-standard for this purpose. However, this procedure requires an additional incision over the front of the pelvic bone near the hip, with extra pain involved, to harvest the bone. In some younger patients, after a simple disc removal, the space that is created is simply left open to heal by itself. Scar tissue and bone will form in the space and with time, the two vertebrae will usually grow together, forming a spontaneous fusion. A newer technique is to replace the disc that has been removed by an artificial disc whereby movement in the neck is preserved at the level of the operation. This retained movement is thought to protect the adjacent discs from early degeneration of one or several discs, by avoiding the biomechanical stresses that are placed on the other discs of the neck by the fusion. There are specific indications for this procedure and the long-term results are only now becoming known and appear quite promising. See the section Cervical Disc Arthroplasty. Some progress on the less invasive surgery front has been made by endoscopic surgery and percutaneous Nucleoplasty. Enquire from your specialist whether these would be an option for you. You may also want to consult a specialist that is proficient in these techniques as well as the usual open surgery techniques. When undergoing the normal operation, you will be lying on your back and the specialist will be operating from the front. Your skin will be sterilised over the front of your neck with a combination of iodine and an alcohol solution and then the area will be covered with sterile drapes. A small incision will be made either transversely or obliquely in the front of your neck and the tissues will be carefully separated until the front of the spine is reached. With the use of a microscope the damaged disc will be removed. In most cases a fusion will be performed by placing a bone block, or an artificial spacer containing bone, into the space where the disc has been removed. 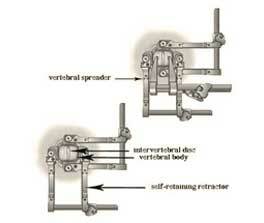 This drawing demonstrates the use of self-retaining retractors. These retractors have a ratchet mechanism that stays open, allowing the specialist to use his hands freely during the operation. 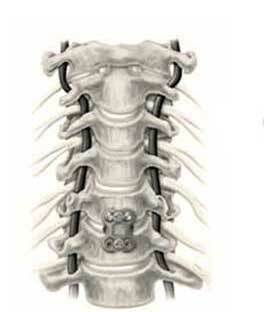 The top drawing demonstrates the vertebral spreaders that pull open the disc space a bit by spreading the vertebrae from each other. This makes it easier to remove the disc. There are surgeons who do not use this technique, but use different ways of spreading the wound and the disc space. Prior to closing the wound, a drainage pipe will be placed in the wound and connected to a reservoir. This will allow all excess blood to drain away and not cause a blood clot next to the breathing tube, which can be quite dangerous. After the operation, you will be taken to the recovery room to recover from your anaesthetic. Afterwards you will be monitored for several more hours to ensure that no blood clots form under the skin of your neck or on the spinal cord. You may mobilise after the operation and the nursing staff will administer analgesia for any discomfort that you may experience. The drainage pipe in your neck will usually be removed on the day after the operation or sometimes, but rarely, the following day. In the ward you may walk around freely. Some specialists require that their patients wear neck collars. This is often because of the specialist's preference or because of certain technical factors. Other specialists will allow you to mobilise without a collar and wear it only at certain times whereas yet other specialists use collars only infrequently. 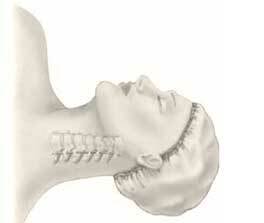 Appropriate neck exercises may be demonstrated to you by a physiotherapist. You would normally be discharged two or three days after surgery with analgesia to take home. A painful throat and even some hoarseness can be quite common and can last for as long as a few months, but usually lasts only for a few days. Discomfort between the shoulder blades is a frequent occurrence and this is because the operation restores the height of the disc space, which causes temporary discomfort that will usually pass after a few weeks at most. Wound care will be discussed with you by the staff or your specialist. 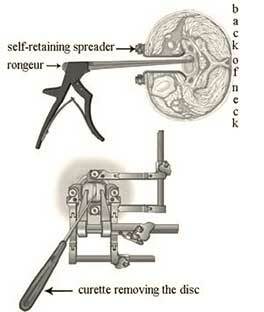 The drawing at the top demonstrates the use of a rongeur, which is a long, thin grasping instrument that also helps to remove the disc. The drawing at the bottom demonstrates the use of a curette, which is a spoon-like instrument that is used to remove part of the disc. This drawing demonstrates the use of a drill to remove any hard bony outgrowths. This is not always necessary and depends on technical factors and specialist preference. 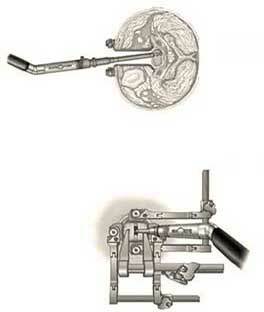 This drawing demonstrates the prosthesis in place in the space that has been created by removing the disc. A metal plate is placed over the top to keep the prosthesis in place. Sometimes the disc space is left open, sometimes a bone block is placed in the space and sometimes an artificial spacer, called a cage, is used. A metal plate is not always used. It is incredibly important to get a lot of rest and exercise following your surgery. Do not try to rush back to work, certainly not before two to three weeks following surgery. It is important to walk for exercise and also exercise in conjunction with the guidelines from your physiotherapist or biokineticist. You may perform normal activities and should only wear a neck brace if your doctor prescribed it. You should refrain from exercises that involve impact, for three months. This would particularly include jogging, mountain biking and equestrian pursuits. You will usually be seen by your specialist after two to six weeks, but may be seen earlier if there are any complications. You would most probably undergo an X-ray of your neck a few months after the operation to evaluate the bone growth between the two vertebrae. It is important that this bony growth takes place, otherwise the operation might have to be repeated.